Would it be stupid to grow peas near carrots? Not a problem as long as the peas don't fall over and smother the carrots. I think if your rows are 32 inches apart you will be fine. Comes to peas, I like to plant 4 rows 10 inches apart. Then they come up and intertwine a bit and kinda hold each other up. I will guess that they should be okay together . . . not inconvenience each other. Alaska peas grow a little taller than some. They are about 36". They are nothing like Sugar Snap or something like that but aren't dwarfs. Peas fix nitrogen in the soil like beans. 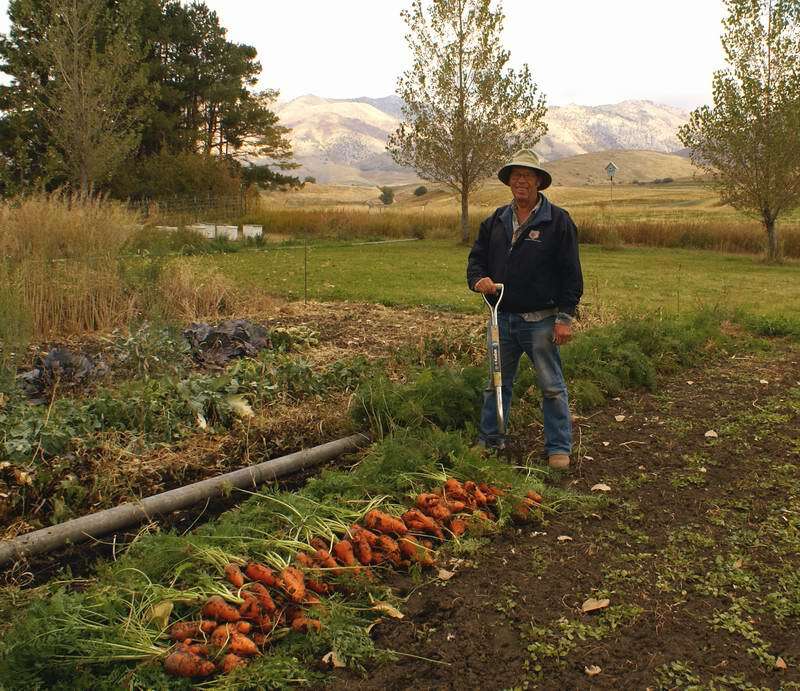 Carrots do not like too much nitrogen or they will produce a lot of foliage and not as much root. I don't know for certain, but that might be a problem. I've always grown things that like nitrogen next to beans and peas. and excess nitrogen may give you "hairy carrots". I'm pretty sure that beans and peas release most of their nitrogen after the plants die down. When the nodules break down they release. Last edited by DoubleDogFarm on Mon Oct 22, 2012 11:10 am, edited 1 time in total. Yeah I always heard not to plant legumes near root crops. But then I read an article about that and they said the nitrogen doesn't even get released until the plant has died and the roots are broken down. So I figure I am alright if I try it. I did some searching and that appears to be true. I guess you wouldn't want to grow root crops in an area where you grew nitrogen fixing plants the year before. You learn something new everyday with any kind of luck. Yes, After a nitrogen boost corn would be a good crop then followed by potatoes. Oh dear, you mean my practice of fertilizing my potatoes is not a good thing? Try to tell the taters that!!! It is my opinion that nitrogen and water are the two things most often in short supply in the garden. My whole garden gets a shot of urea, 42% nitrogen, at time of planting and a side dressing later. This is in addition to all the organic matter I can find to go on it too. I keep hearing things like: "Nitrogen makes the potato grow lots of leaves at the expense of roots." Well, I am here to tell you it takes leaves to make the food that is stored in the tubers. More leaves = more food. I could go on about this, but the only way you can find out for yourself is to make two plots. Plant both with potatoes, everything else being equal, but fertilize one well at planting and side dress it 5 weeks later. Then measure the weight of tubers that you get from each plot at harvest. Try it with carrots too. jal_ut wrote: Try it with carrots too. I don't think I would. 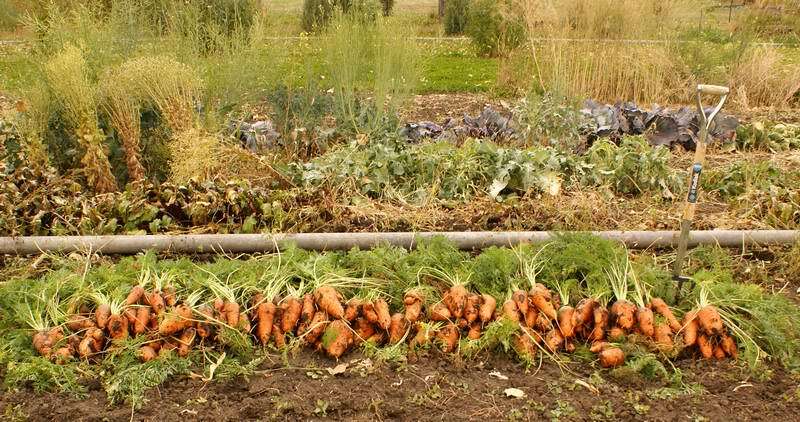 I work in a few inches of composted manure to the soil in my carrot containers in the fall. I plant carrot seeds in the spring and add water, never any more fertilizer. I'm very pleased with the results. I wouldn't change a thing. Legumes do indeed have nodules of nitrogen fixing bacteria on the roots if that bacteria is present in the soil. It is no guarantee that the bacteria associated with the host plant is in your soil. Most of the nitrogen the bacteria fixes is used by the host plant. It is not available for other nearby plants to use. When the plant is done growing and if incorporated back into the soil, it will break down and make some nitrogen available to any crop that follows. 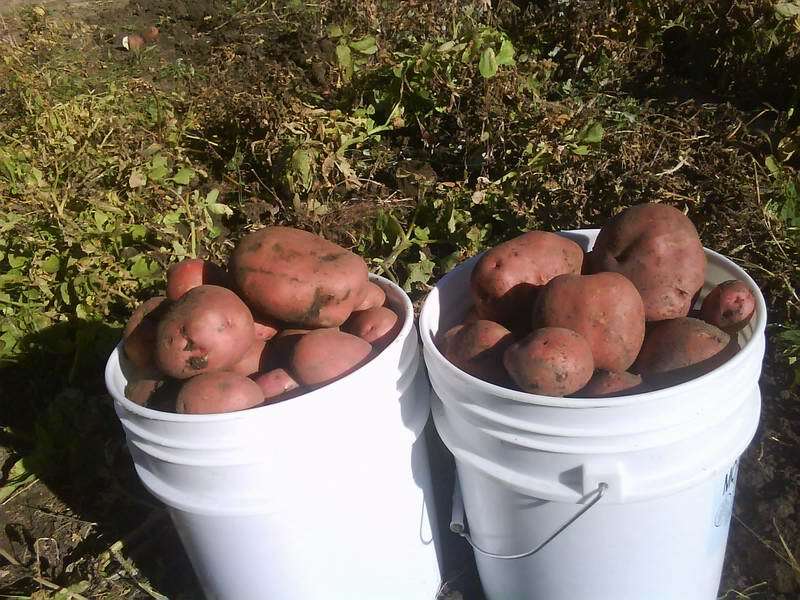 Since the foliage of beans and peas are not what we harvest, the growth is available for enriching the soil for next year. Hence it is a good green manure crop. Go back to my statement: "It is my opinion that nitrogen and water are the two things most often in short supply in the garden." I firmly believe that most garden plants on most soils will benefit from the addition of some nitrogen. Yes, there may be exceptions, if the plants are growing in a manure pile they probably have plenty of nitrogen. A word about internet searches for this 'n that: Any search well likely turn up a thousand hits or more. I prefer to look at the ones from Wikipedia, and any that are from universities or extension services. These guys have done the research. Other hits often come from other sources where you have no idea of the qualifications of the speaker. They may be in error or speaking of folk lore. Who is to tell? It is well to look at the source and question the validity of anything you read on the internet. Lets be well informed with good information. Sweet Garden Peas and Southern Peas - anyone grow both? grow carrots in a cold frame?